Would highly recommend. PLEASE consider older people like us who would enjoy a ship library that is not in a smokey corner. With the fascinating ports and with clientele somewhat older, an historical library would be appreciated. This was the first and last time I will sail on MSC cruise line. Over all is good cruise. Its not a big ship, but is good and the port we visit are good! I have taken more than 10 cruises in my life. This is my second European cruise, but from a European line. The food and entertainment was far superior than other lines like NCL or Royal Caribbean. Highly recommend MSC, but take note they do not make announcements for everything and anything so you must make sure to read your daily program. I wouldn't recommend a cruise on the Sinfonia. 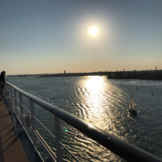 We did the 7-day eastern Mediterranean cruise out of Venice. 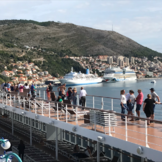 This ship is on the small side and the on board activities are limited, but we booked it because we were excited about the itinerary. Unfortunately the ship had mechanical issues so we missed the stop in Mykonos entirely (and it was only going to be a few hours anyway, the way the itinerary was advertised is misleading). Not only was this disappointing, but MSC was very reluctant to provide updates about what was happening, so we were stressed not knowing how much additional disruption to expect. But the biggest complaint would be the food. We booked the Aurea package, and despite reading some negative reviews about the food before we left, assumed that having the my choice dining in the Il Covo restaurant would get us access to a higher quality of dining. That was not the case. We got sick off the food our fist night on the ship, and a number of the dishes we were served throughout the cruise were simply inedible. After our dinners in Il Covo we would go to the buffet looking for other options, and what really floored us was that a number of the dishes served in Il Covo each evening were also served on the buffet. So all the Aurea dining package bought us was the same bad food as the buffet but plated and brought to us by a waiter. I wish I had taken the negative reviews of the food more seriously before I booked the cruise, it was really disappointing. I will give credit to the staff, who for the most part we found helpful and friendly. When the boat had mechanical problems, they were stuck in the same situation as us not knowing what was happening, and they tried their best to keep things positive. Overall, based on our experience, I wouldn't recommend a cruise on the Sinfonia. I believe that by taking away the opportunity for the crew to gain tips for giving quick, efficient service with a smile (none of the staff smiled at passengers except for the wait staff in the My Choice Dinning room) may be one of the reasons most of the staff seemed to hate their jobs. This new policy regarding tips is the only thing I can think of that may have caused such a different experience with the staff on board this ship as compared to my experience 3-4 years ago on an MSC cruise out of Rome where the entire staff was always friendly and helpful. The worst cruise experience ever, I have sailed over 20 cruises with Royal, Carnival, 1 Costa and 1 MSC prior to this MSC. We had a good experience on the Poesia from Ft. Louderdale and thought this will be the same. 1. The food is the worse from any cruise ship we have been on. No steak, no Lobster, smelly shrimps, salty fish. 2. Never heard of WATER packages before, to pay for tap water is insane. The first thing they bring you at the restaurant is a jug of water with ice. Here you have to pay for water or carry a bottle with you that you can fill on deck and walk with it to the restaurant. This is a NO on any cruise. If you want you can pay for bottled water but for tap water at a restaurant is unacceptable. 3. The toilet did not flush correctly for the first 3 days on board, fixed at least 2 and worked on the 3rd time. The cabin steward was amazing though. He did everything he could do and the room was always clean and tidy. 4. No towel kiosks at the pool, you stay with your wet soaking towel till the end. New towels brought in to the room every night. 5. We thought it was a mistake to be in Mykonos from 8 pm to 3 am in the morning, instead of splitting the day/night between Santorini and Mykonos, and half day in Dubrovnik. It made more sense to skip Ancona where there is nothing to do and spend 1 full day in Santorini, Mykonos and Dubrovnik. It's a Italian port city and few people embark there. Horrible port of call. 6. Each announcement is in 7+ languages and to listen and sit thru that is just horrible, everyone complained, usually it's English and the ships own language here Italian, maybe add Spanish but not to have all these languages. No more MSC for me for sure and won't recommend this ship and itinerary to any one I know. The food and staff of the Sinfonia were very good. They remembered us and what we liked. The onboard activities were lacking for people our age. If we were able to go to all of our locations it probably would not have mattered but we had 2 days at sea that were not planed and did not get to Mykonos. The evening shows were really bad. South Africa was fantastic. The cruise ship was not the best we have been on. On board spend was expensive, £15 four AA batteries, £3 for 8 in Isreal. First time we have had to buy water in the restaurant. The last week of the cruise the ship was running out of butter, coffee, tea etc. entertainment was good and the staff was very good. My favorite part of the cruise was the ports in Africa - Cape Town and Dakar. Our suite was good in that it was spacious with a tub and marble floors, however, the advertise that the ship is modern and updated - it is not! The South African people on the cruise and the South African staff were so friendly. The Italian staff was rude and the entertainment was juvenile. The food was low grade. All services on board was offered at the convenience of the cruise line, not the passengers. 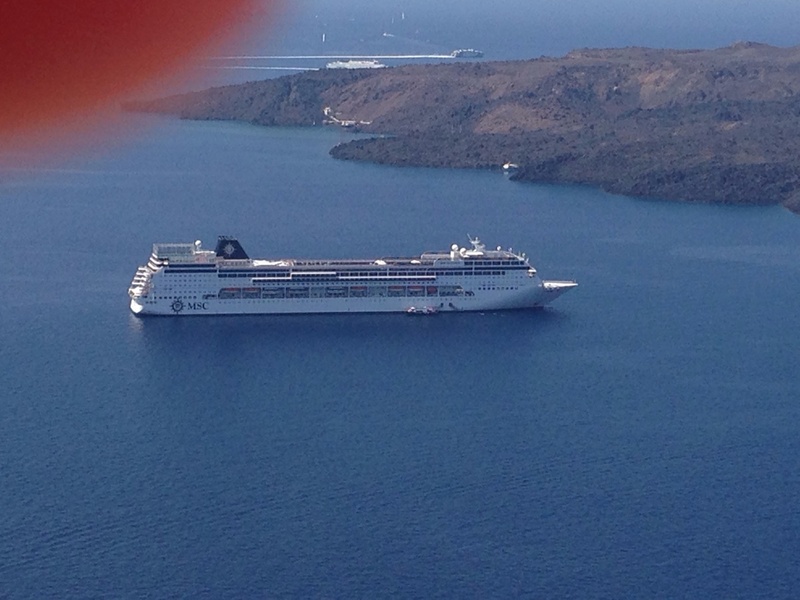 If you do not take their excursions, getting off the boat is made more difficult. Meals were offered at limited and rigid times and not convenient for those of us who like to go ashore on our own. Will not take MSC again. Good cruise, good food, friendly staff - but unfortenately, smoking is aloud in serveral restaurants, bars, on the main deck etc. This was very disturbing, since the entire ship smells of smoke!!! The animation on the sun deck with super-intelligent games (???) is just way too loud and unnecessary. You may hardly conversate. A cruise also is for relaxation and enjoying the beauty of the sea - and not just party alone. Buffet food was mediocre and the hot food was luke warm. Excursions for the most part were not that great. Many excursions wasted much time getting ready and traveling, limiting time at the site. Ibiza sunset excursion was terrible; we were dropped off in the town center without a clue whereto go to see the sunset. Cruise crew and staff were extremely friendly and helpful. The ship was a smaller ship, and was in good shape. We have taken 15+ cruises and this was the worst. The ship advertised 24 hr coffee tea and water and did not have it. You would return from port and not be able to find a snack, not even a cookie or sandwich. The quality of the food was not up to the standards of any of the American cruise lines. For an Italian line, Costa has much better service and amenities. We didn't want to cruise Europe with a rock climbing wall or water slide, so we payed more for this line, but we had hoped for food and pleasantries. It was a nice clean ship to begin with. This is not a children oriented cruise, but there were many of them. The excursions are pricey and not very worth it. Everything is included in price as far as food outside of drinks, ice cream, and room service. Very nice to have all announcements in every language needed. Itinerary is given at the end of every day for the next day's adventures. No real city information given if you do not go out on the boat excursion. Not very much time in some places even though it may be a huge city. Very nice ship . Not to big and not to noisy. Clean and freindly staff. The Sinfonia is a well appointed vessel with many new facilities and emenities. The staff, crew, entertainment, and service was excellent. From the reception staff to the food service staff, without exception everyone was genuinely kind, pleasant and accomidating. We could not have asked for better service. As I travel quite a bit for my profession, I have become accustom to five start accomidations and hospitality. I was very much at home on the Sinfonia. A truly exceptional experience. This ship is about one year old and very well maintained. The cabins are good size with the most storage I've ever had. The bath is small but adequate. The outside rooms have a very large picture window. The public rooms are well appointed and comfortable.